After having typically appeared in the hallowed pages of Baseball Think Factory, Dan Szymborski’s ZiPS projections have now been released at FanGraphs for more than half a decade. The exercise continues this offseason. Below are the projections for the Milwaukee Brewers. With the position players, we have the sizzle that moved the Brewers from an adequate team to a very good one, thanks to the additions of last year’s best, high-profile free agent signing in Lorenzo Cain and the best, high-profile trade in Christian Yelich. ZiPS was a believer in both — I peppered my articles last winter with predictions of a Yelich breakout and Cain as the best free agent hitter available after J.D. Martinez — so the two of them having MVP-type seasons hardly should make ZiPS sour on them. And it didn’t! Sure, Cain turns 33 early in the season, but his defense hasn’t declined as of yet. Indeed, he may actually be underrated at this point; he should have made a minimum of four All-Star appearances rather than a measly two. I feel for Manny Pina, who is essentially getting pushed aside for Yasmani Grandal, and while the Brewers absolutely should prefer Grandal — he’s younger, better, and signed to a ridiculously team-friendly contract — Pina’s been perfectly adequate behind the plate. 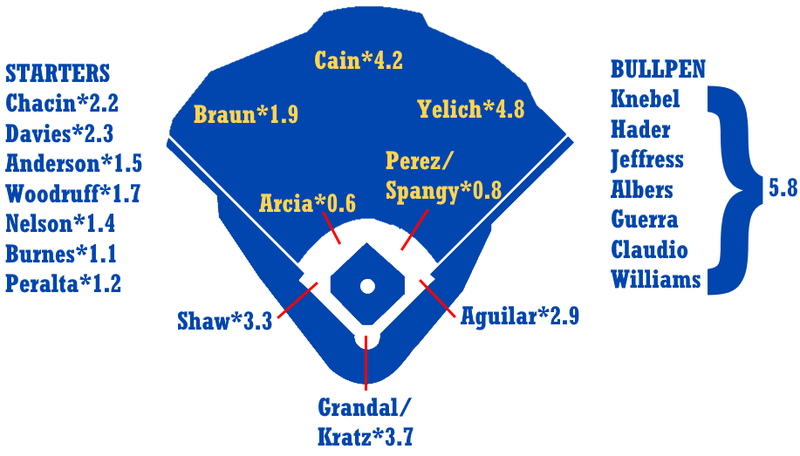 The depth charts have Kratz backing up Grandal, but I’d suspect that in a time when the catcher position is weak around baseball, Milwaukee will trade Pina, or play him for a bit before leaving him open to a waiver claim later in the spring. I’m kind of sad that Arcia’s projection for 2019 is so light on WAR. He’s always been a favorite of mine, but if he’s not matching his minor league glove reputation in the majors, he’s not much of a starter unless his bat rebounds in a big way. ZiPS is once again more bullish on the Brew Crew’s starting pitching than Steamer is this year, but it still doesn’t see any of the Brewers as an obvious ace type. It’s easy for people criticize Steamer based on the current depth charts, but I think people are underestimating the challenges of projecting essentially the entire Brewer rotation. Each pitcher who is likely to contribute has at least something that makes it difficult for any prognosticator to do their job. Let’s take a look. Jhoulys Chacin beat his FIP by half-a-run thanks to a .250 BABIP. He’s shown no signs of being able to do this repeatedly in the past, but also spent a lot of his career at Coors, which is obviously an extremely difficult environment for a pitcher. Zach Davies looked like he was becoming a solid No. 2 or 3 guy, but missed significant time with shoulder injury in 2018. When it comes to Chase Anderson, well, there’s beating your FIP, and there’s beating your FIP, and Anderson did the latter in 2018, besting it by nearly a run-and-a-third. ZiPS buys that there’s some ability here, but just how big that ability is remains up in the air. Brandon Woodruff was up-and-down all year after struggling early, but will likely to get rotation spot despite only four major league starts in 2018 (he had more in the minors). Jimmy Nelson missed the entire 2018 season due to shoulder surgery. Corbin Burnes has yet to make a major league start. Freddy Peralta has a stat profile that looks like that of a guy who throws 97 rather than 90-91. ZiPS was closer when it came to the Brewers last year, but that’s not necessarily predictive; it wouldn’t take a lot for Steamer to win this battle. I’m less certain about the Brewers’ projections, at least on the pitching side, than I am most others this offseason. ZiPS buys Keston Hiura, and while it doesn’t have him becoming prime Dan Uggla or anything — I’m not sure why I chose Uggla here — the computer thinks that he’ll force his way into a job fairly quickly. I don’t think the Brewers will do with him what the White Sox did with Eloy Jimenez, and I suspect that if they weren’t going to give Hiura every opportunity to clear the field this summer, they’d have tendered Jonathan Schoop a contract. The projections now have Mauricio Dubon as the equal of Arcia, though a large part of that has to do with Arcia’s forgettable 2018 season. That the projection is damning with faint praise is further evidenced by the fact that ZiPS sees Tyler Saladino as roughly equivalent as well. After Hiura, Dubon, Trey Supak, and Zack Brown, ZiPS sees the quality falling off very quickly, not expecting Corey Ray to ever make enough contact to be an effective major league hitter, or Lucas Ercerg to be better than a reserve. We hoped you liked reading 2019 ZiPS Projections – Milwaukee Brewers by Dan Szymborski! That black hole at 2B makes so much sense to plug Hiura in soon, and not pull the Eloy Jiminez thing. But I was also surprised to see the system doesn’t love him as much as scouting reports seem to. Could still theoretically re-sign Mouse and move Shaw to 2b while Hiura gets a season in San Antonio. That’s very true. I wonder how a full season of 2B would impact Shaw’s WAR?